You say "blind superhero" and most people think Daredevil. Okay, no, most people mutter "nerd" under their breath and roll their eyes at you. But those in the know? They think Daredevil. However, there was another blind superhero created two decades before: the Golden Age Dr. Mid-Nite. Of course, he was killed by Hal Jordan during Zero Hour, so now we have a new guy with a badly spelt name. Dr. Pieter Anton Cross came into contact with a dangerous drug that altered his body chemistry, enabling him to see light in the infared spectrum. Wearing goggles, due to blindness in normal daylight, the medical prodigy is the doctor most superheroes have come to trust. Yes, unlike most comic characters who go by the name of "Dr. (Something)," Mid-Nite is a real medical doctor, with a degree and everything. He's gotta be a general practitioner, because he's been shown doing pretty much anything medically related. Autopsy, oncology, emergency surgery, annual checkups... at the rate he's going, he'll soon be giving other heroes dental cleanings. As soon as DC figured out it had a functioning doctor on staff, so to speak, he started popping up in any scene that required even a little medical attention. The Golden Age Dr. Mid-Nite had a really nice costume (especially when you compare it to that of his teammate, the Atom), and the modern version only makes minor changes to the look - basically, they made it darker. It's still a black bodysuit with a red tunic, but the cape is black instead of green, and he wears silver bracers instead of bright purple gloves. It's a good look. So good, in fact, that Alex Ross stole it for Red Robin. 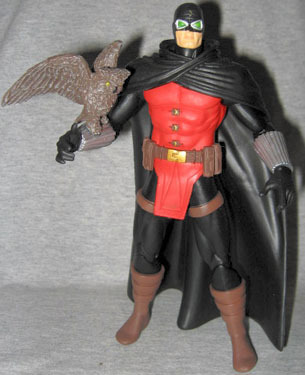 Dr. Mid-Nite is 6½" tall, and moves at the neck, shoulders, elbows, wrists, hips, knees and boots. The sculpt is generally good, but the crescent moon details on his costume - the buttons and especially the crest on his forehead - are a little too small. Barsom, the sculptor, did a good job duplicating Dr. M's improbable cape. His goggles seem to be separate, translucent pieces with eyes behind them. Neat! For some reason his feet won't rest flat on the floor, instead rolling toward the inside. But his cape is just long enough to help him balance. The figure has one accessory, but it's a logical one: his owl, Charlie. Both Golden and Modern Age Docs had owl sidekicks, and both figures have included the bird, though they each dealt with it in different ways. 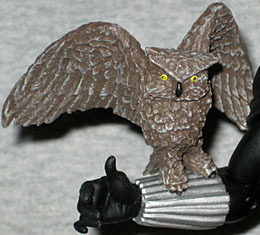 The old figure had a removable glove with the owl molded to it - this new one has a magnet on his wrist, and the owl has bits of metal in his feet. The magnet isn't very strong, but it'll suffice. Charlie - named after the original Dr. Mid-Nite, Charles McNider - is sculpted and painted well. Since he was a trained doctor first, Dr. Mid-Nite retains those qualities as a superhero: he projects an air of unshakeable confidence and has steady hands and a great bedside manner. The vials on his gloves and the pouches on his belt contain various drugs and medicines, and he'll often stop to assist injured civilians during a battle. And on a different note, until Green Arrow came back from the dead, Doc was the one making Black Canary's fishnets moist. Since he's interacted with almost every other DC hero, this figure is a good addition to whatever kind of collection you have.